New York’s largest state park, 2373 ASP Rt. 1, Salamanca, New York, offers over 65,000 acres of rugged beauty. 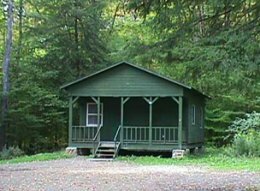 Camp, hike, bike, swim, kayak, snowmobile, cross-country ski, fish and hunt in a mixed hemlock and hardwood forest with rolling hills, meadows, ponds, and lakes that attract devoted outdoor enthusiasts year round. Offering 424 campsites and 375 cabins, the Allegany State Park is a campers’ paradise. The winterized vacation rental cottages and cabins make camping fun in every season. The hiking trails, three lakes, amazing rock formations, guided nature tours, makes the Allegany Region a great place for any family vacation. 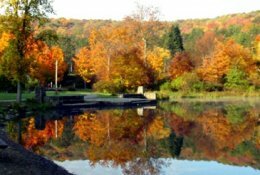 The Quaker Area is known for its two lakes and wonderful camping experiences. It offers a sandy beach for swimming, two fishing piers and a canoeing or kayaking access point. An extensive environmental education program is offered at the park. Red House Lake offers 5 miles of paved bike paths, boat and bike rentals, a sandy beach for swimming, fishing and snowmobiling. In the winter, cross-country ski trails and snowmobile trails offer seasonal outdoor recreational opportunities. The park is open year round. Vehicle entry fees start at $6 and are collected between 9 am and 4:30 pm. The park is part of the New York State Office of Parks, Recreation & Historic Preservation. Entrance to the Allegany State Park can be from the south via Interstate Parkway, Bradford, Pennsylvania, and / or via New York Interstate I-86, exit 18.